In vapor intrusion, “background” is contamination in indoor air that came from outdoor (ambient) air or from interior sources, such as cleaning products, paints, and plastics. Owners of facilities associated with soil or groundwater contamination might be obliged to mitigate vapors at their own and at surrounding properties, and if they can’t distinguish between vapor intrusion and background, they might be paying for someone else’s problem. Worse, most vapor-mitigation systems prevent soil gas from entering the building, and if vapors are from background, the system won’t help. EPA’s 2011 report on background contamination shows some interesting trends. The authors compiled the results of indoor-air samples collected from residences with no known or suspected vapor intrusion. As seen in Figure 4 from this report, below, benzene, chloroform, and TCE were present in 91%, 68%, and 43% of residences, respectively. Naphthalene does not appear on this graph, because its molecular weight is somewhere between those of volatile organic compounds (VOCs) and a semi-volatile organic compounds (SVOCs), and was often excluded from VOC sampling. But the toxicity and volatility of naphthalene, together with its widespread occurrence in background, have earned it a place on the list of vapor-intrusion compounds, and on the list of problem compounds. According to the Montana Department of Environmental Quality’s 2012 background investigation, naphthalene was detected in 40 out of 50 residences with no known vapor intrusion. 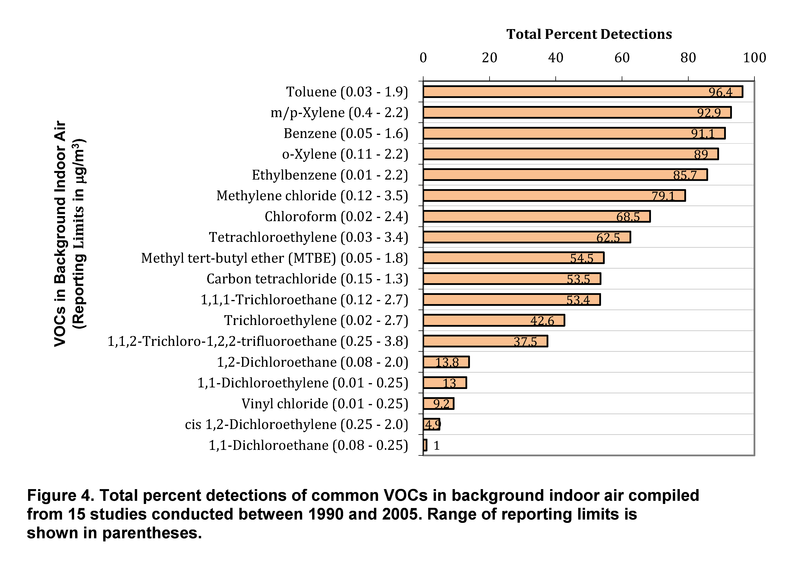 Figure from USEPA 2011, Background Indoor Air Concentrations of Volatile Organic Compounds in North American Residences, EPA 530-R-10-001. Where do these compounds come from? Benzene is the B in BTEX – benzene, toluene, ethylbenzene, and xylenes, all of which are widely associated with gasoline and other fuels. Benzene poses the greatest problem of the BTEX compounds, since the other three have comparatively low toxicity. Benzene is also the base for countless manufactured chemicals, so of course, benzene is commonly detected in the subsurface, and is a common constituent of concern for vapor intrusion. Benzene is also ubiquitous in ambient air, especially in metropolitan areas, due to vehicular traffic and fuels. Benzene also can be expected in background in buildings with attached garages, due to its presence in vehicular gas tanks, gas-storage cans, and lawn equipment. Chloroform is normally present in chlorinated water, and not surprisingly, chlorine is common in indoor air. But tap water is not the only source, and perhaps, not the most important source of chlorine in indoor air. At vapor-intrusion conferences, speakers often report high levels of chloroform in indoor air, but when I ask them where they think it came from, they rarely have an answer. However, a number of recent investigations have focused on sewer gas, and found that dry plumbing traps, breached toilet-wax rings, loose pipe fittings, and other conditions often allow sewer gas to enter buildings, bringing chlorine with it. Whatever the source of chloroform in background, Massachusetts’ 2008 Technical Update – Residential Typical Indoor Air Concentrations indicates a median concentration for chloroform of 1.9 ug/m3. The residential VISL in Ohio is 1.2 ug/m3. Good luck with that. At one time, naphthalene was the main ingredient in mothballs, but it’s been replaced by chlorinated compounds to reduce the risk of fire. Naphthalene is typically associated with coal and the heavier petroleum oils. Naphthalene has the lowest residential indoor-air VISL of the big four compounds, at 0.83 micrograms per cubic meter (0.83 ug/m3), using Ohio standards of 10-5 cancer risk, and a hazard index of 1 for non-carcinogenic compounds. Consequently, the lab’s reporting level for naphthalene, even using 6-liter “Summa” cans, might exceed indoor air screening levels, unless results are reported to Method Detection Levels (MDLs). Reporting to MDLs generally results in the detection of numerous additional compounds, making data validation and interpretation more complicated and costly. The additional information seldom changes the final assessment, but if ya’ gotta, ya’ gotta. And, finally, TCE rounds out the list of four bad players. We’ve discussed TCE a number of times, including in the August 2017 edition of Focus on the Environment, but in case you haven’t heard, TCE drives most of the vapor-intrusion work in recent years, due to concerns over fetal heart defects. Much or most of the concern with vapor intrusion is tied to the risk of cancer, which generally develops over years or decades. Although, as discussed in previous articles, the link between TCE exposure and fetal heart defects is in doubt, EPA assumes that a single day of exposure to TCE is sufficient to cause harm, so regulatory agencies are prioritizing TCE sites and pushing for rapid vapor-intrusion assessments. Determining if indoor constituents are present in soil gas. If not, they’re probably from background. Comparing indoor air to outdoor ambient air. Contaminants in outdoor air represent, by definition, background. Comparing ratios of indoor constituents to soil-gas constituents. Vapor migration from subslab to indoor air involves only dilution, so the ratios of chemical concentrations in indoor air should be pretty much the same as the ratios in soil gas. Conducting a survey of vapor-forming substances inside the building as part of the initial vapor-intrusion assessment. Compounds with anomalously high concentrations in indoor air may be associated with these materials, or with activities and substances used during sampling. Comparing indoor-air concentrations to EPA’s background report, and others. 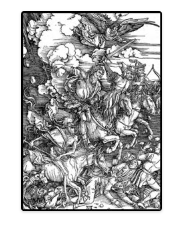 Common background constituents, e.g., BTEX, should generally be regarded as suspect. More often than not, one or more of the problem compounds represent background, and cumulative risk from the remaining compounds is acceptable. Understanding the sources and significance of these four compounds is critical to eliminating unnecessary costs and efforts.